It's been an extraordinary past few weeks for the citizens of Massachusetts as well as for the entire country. The tragic events at the Boston Marathon on Patriot's Day and the weeks following will forever be seared into our collective memories. The bombings, subsequent violence, the lockdown, an historic manhunt, and the eventual capture of a dangerous fugitive not only shook us but led us to summon our most enduring and positive of human qualities. We listened and watched in awe to the stories of first responders (and ordinary citizens) who rushed into harm's way to aid the injured and dying. In the days afterward, we collectively grieved. Slowly, now, we collectively heal. For the hundreds of Amateur Radio volunteers from across New England who came to serve that day, the Marathon was going to be a fun, routine public service event. Sure, operators at previous Marathons have endured hardships and weather-related challenges. Temperature extremes in years past have resulted in hundreds of requests for ambulance transport to area hospitals. One year, there was even a fatality. But in all of the thirty-plus years of Boston Marathons in which amateurs have served, this one was without precedent. 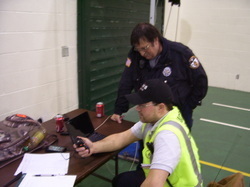 Amateur Radio volunteers performed admirably during the period where they were covering a normal public service event. BAA officials in Hopkinton successfully ensured a smooth and safe start, thanks in part to efficient communications provided by the hams that shadowed them. Checkpoints and first aid stations were able to verify and obtain needed supplies, and later, coordinate the transport of runners. Red Cross officials who crisscrossed the course were kept in the loop always, thanks to their Amateur Radio shadows. But then ... 2:50 PM. Initially, rumors and vague reports surfaced. CNN texts and other media alerts began to light up smartphones. Phone call volume increased. In fact, in many locations along the course, cell phone service crashed under the strain. Soon, it was apparent to everyone that a major disaster was unfolding, and amateurs were caught up in the middle of it. The jarring directive went out over the amateur networks to halt all runners. The BAA's mission abruptly changed, and new priorities were quickly introduced. As Marathon volunteer Tim Carter, W3ATB of Meredith, New Hampshire succinctly puts it, "The bombs created a new set of problems. How do the runners stay warm? How do the runners get fed? How do the runners get to their belongings? How do the runners discover if their loved ones waiting at the finish are okay? How do the runners let their loved ones know where they are? How will thousands of runners be transported to who-knows-where?" News coverage of the bombings and subsequent capture of the suspects has, of course, been non-stop and numbing. Soon, for the first time the behind-the-scenes story of Amateur Radio at this Boston Marathon will appear in the volunteers' own words in the pages of QST. I want to thank our Section Emergency Coordinator Rob Macedo, KD1CY, for helping to pull together much of the material that will appear in these stories. Some of the other contributors include: Paul Topolski, W1SEX, District Emergency Coordinator for Worcester County, Western MA; Steve Schwarm, W3EVE, DEC for Field Operations, Eastern MA; Tim Carter, W3ATB; Carl Aveni, N1FY, Assistant SEC; and Terry Stader, KA8SCP, DEC.
ARRL Headquarters. Jim Palmer, KB1KQW, handled videographer duties and the livestream of the National Hurricane Conference with assistance from Mike "Sparky" Leger, N1YLQ. The morning presentation featured discussion of Hurricane Isaac and the Amateur Radio response in Louisiana by Matt Anderson, KD5KNZ, from GOHSEP. Matt explained the local response to Isaac and the hurricane's impacts to the region. Isaac, while not as strong as Katrina, provided a significant impact in terms of power outages and tree and wire damage as well as damage to levees in other parts of southern Louisiana that were not affected by Katrina and other past hurricanes. Matt reported that Hurricane Isaac did not have a significant impact to communications infrastructure in the area. southern New England even though the center of the system tracked several hundred miles to the south to southern New Jersey. to understand the amount of significant damage that took place over the state. A video was then shown on the impact of Hurricane Sandy across southern New England, the New York City and mid-Atlantic regions. operations since 1980 including the move of the National Hurricane Center in the mid 1990s, and the use of digital modes and APRS weather stations across the Caribbean islands. They described the criticality of providing surface reports both in near real time and post storm and how they can affect the historical record of hurricanes and tropical storms. presented tremendous value to the agencies involved in the response efforts for the earthquake and represents one of the most critical Amateur Radio missions completed in recent memory. Dr. Richard Knabb, the Director of the National Hurricane Center, presented from his perspective the importance of Amateur Radio surface reporting and described a case where reports from a ship at sea off the coast of El Salvador helped to change the historical record of a tropical system. Dr. Knabb impressed upon attendees how important hurricane preparedness and reporting is and reaffirmed his commitment to Amateur Radio operations at the National Hurricane Center. Representatives from the Hurricane Watch Net and VoIP Hurricane Net presented their nets. Joe Stepansky, KQ3F, presented on the Hurricane Watch Net and their mission that started in 1965 and is entering its 49th year of service to the mission of surface reporting and communications during hurricanes. Joe described their need for net control stations across different parts of the country, bilingual operator needs, having stations in the affected area of hurricanes reporting into the net and using HF frequencies beyond their standard 20 meter frequency of 14.325 MHz. Rob Macedo, KD1CY, who is also the Director of Operations for the VoIP Hurricane Net, described the VoIP Hurricane Net method of using both Echolink and IRLP in a combined network and described the amount of surface reporting and contact with the New Orleans area during Hurricane Isaac via a video presentation. The VoIP Hurricane Net is also looking for additional net control operators and stations in the areas affected by hurricanes. ARRL Emergency Preparedness Manager Mike Corey, KI1U, provided an ARRL update on emergency communications. This included an update on the ARRL HQ Incident Management Team that activates for significant incidents and recent work in the past year with FEMA. The day of workshops ended with a Q&A session with the panel of speakers. The WX4NHC Hurricane Season 2013 On-The-Air Station Test will be held Saturday, June 1st, 2013 from 9 AM - 5 PM EDT (1300z-2100z). The purpose of this event is to test the National Hurricane Center's Amateur Radio station equipment, antennas and computers. We will also perform operator training in preparation for this year's hurricane season. We will be making informal contacts on many frequencies and modes and would appreciate signal reports and basic weather data exchange ("Sunny," or "Rainy," etc.) from stations in any location. WX4NHC will be on-the-air on HF, VHF, UHF and 2 and 30 meter APRS. We plan on testing on the following voice frequencies: 3.950 MHz, 7.268 MHz, 14.325 MHz, 21.325 MHz, and 28.425 MHz. We will try to stay on 14.325 MHz most of the time and announce when we QSY. You may be able to find us on HF by using one of the DX Spotting Networks, such as the DX Summit Web Site. We will also be on the VoIP Hurricane Net from 1 PM to 3 PM EDT (1700z-1900z) (IRLP node 9219 / EchoLink WX-TALK Conference node 7203). Local South Florida area VHF and UHF repeaters will also be contacted. With the 2013 hurricane season approaching, the National Hurricane Center (NHC) in Miami and the Hurricane Watch Net (HWN) are gearing up for what could be a very active storm season. In preparation for the upcoming season, the HWN is currently seeking new members who can serve as net control stations. The HWN provides on-the-ground, real-time weather data from Amateur Radio operators who volunteer their time to monitor their calibrated home weather stations. The stations report that data to the HWN, who in turn reports it to WX4NHC, the Amateur Radio station at the NHC. "The Hurricane Watch Net relies on volunteer operators -- our members -- who serve as our net control stations," HWN Net Manager Bobby Graves, KB5HAV, told the ARRL. "HWN members are hams who have above-average stations, are capable of effectively conducting HF net operations and are willing to commit their time to operating in support of the HWN's mission during net activations. The net sessions can be long and, at times, very stressful." The HWN primarily operates on 14.325 MHz, but Graves said that given the current solar activity, the HWN is looking for new members who can help with net control station duties on the low end of the 40 meter phone band. "If 20 meters goes away, we lose the ability to effectively communicate with our reporting stations or the NHC," he said. "By expanding our operation to 40 meters, we can easily change over when propagation changes." 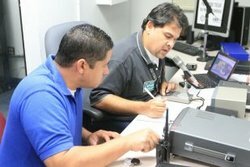 Graves told the ARRL that the HWN is especially looking for new members with stations that can effectively communicate with Central America and the Caribbean, Mexico, the Gulf Coast, the East Coast and South Texas. "As we head into the 2013 hurricane season, we're looking for qualified amateurs who are located anywhere within North America or the Caribbean," he said. "We are also looking for bilingual hams. We recognize that some Latin American operators hesitate to check in and send reports to us if they aren't fluent in English, so we're also interested in hearing from hams who are fluent in both Spanish and English. When we're working storms that are either affecting or threatening areas where Spanish is the language of choice, we always try to have one or more bilingual HWN members on hand to help with reporting." While HWN membership is required to serve as a net control station, radio amateurs do not need to be an HWN member in order to participate as an HWN reporting station that provides observed or measured weather reports, or relay assistance as required by HWN net control. If you are interested in becoming a member of the Hurricane Watch Net, please visit the Membership Information page on the HWN website. With the increased interest in operating on a portable basis, hams can find it difficult to transport their equipment in a secure container that affords not only insulation and protection during transit, but also in dealing with the space limitations of RV's. Velcro strips glued to the wood tray. The top of the tackle box doubles as storage where I keep a 60 watt dummy load, hand mic for SSB, keys, pens, and the 7 inch TFT display that plugs into the IC-7000. The power cable for the monitor, video cable from the 7000 and a USB cable from the SignaLink is fed via three holes drilled in the bottom of the storage tray and lead down to the 7000, SignaLink and a 12 volt Anderson power block. The USB cable is used to connect a laptop while in digital mode. Being plastic, the box was easy to cut and drill. other for ground (green). Both sides of the ground mount are soldered together inside so that no matter which side is used they go to ground. All ground connections inside the box -- rig, tuner, coax, etc. -- are tied to the Anderson ground terminal. Power is provided by an external Jetstream JTP34BCM switching 35 amp supply. I chose this particular supply for the ease of connection as it has PowerPole connectors front and rear. The 12 volt surface mount on the back of the Go-Box is connected to an Anderson six port power block attached to the upper shelf and sitting behind the watt meters where there is ample space. An internal power supply can be used; however, consideration must be given for running 120v AC into the Go-Box. I did not want AC inside the cabinet. The Jetstream provides more than enough DC to do the job. A smaller supply could be used but I already had the Jetstream and avoided purchasing another. Coax and power cabling needs to be kept as short as possible. There is not a lot of room behind the equipment and binding can take place when the trays are slid in. I had to cut a notch out of the bottom tray to allow for the microphone connection or use the connection on the rear of the 7000.The notch is visible beneath the VFO. The IC-7000 runs hot in the digital mode, even at 25 watts and additional cooling should be provided as the temperature gauge will climb into the red after prolonged use. I increased cooling by cutting a 2" diameter hole in the top shelf behind the VHF watt meter directly above the rig and installed a muffin fan facing down on the IC-7000 heat sink. This proved not to be enough cooling for long winded RTTY running at higher power, so another 2 inch muffin fan was installed in an upright position behind the LDG tuner facing the rig heat sink. In addition to the internal fan, there are now two external muffins cooling the rig. This did the trick and overheating is no longer an issue. The fans are plugged into the power block so they can be unplugged if not needed. Since they are muffin fans, noise is not an issue and can be left on. If digital modes are not going to be used then one fan is ample to do the job. There is no finite number of configurations available or rigs that can be used. If it fits it can be made to travel. My first version had an ICOM IC-2200H mounted in the mobile bracket in place of the SignaLink but I removed it as the IC-7000 has 2 meter capability. Two of my local friends use the ICOM IC-706mkIIg with great success using an internal power supply. I am very active in our local ARES group (ARESLAX Northwest) and take part in many mock drills throughout the year with the LAPD, Highway Patrol, Sheriff's Department, Metro Security, Fire Department, FBI, local police, hospitals and so forth. Some of these drills last 7-8 hours and I always learn something from them. However, they are drills and are therefore not as stressful as a real situation. It occurred to me that in certain parts of the country some hams deal with real hurricanes and tornadoes every year. These hams must have a wealth of knowledge that many other emergency communications groups do not have, based on hard experience. Has there been any thought to have some way of sharing the valuable experience that the hams who deal with annual disasters with those of us who have no "real" disaster experience? Is there any kind of database of "lessons learned" or what worked and what did not work? On Thursday, April 18th, members of the Will County ARES (WCARES, Illinois) group received a text message alert that members were needed to support a shelter and the EOC of Plainfield for communications. With rain falling for the past weeks, followed by heavy rains the previous two days, help was needed. The rivers had crested, sending water into homes and the streets. shelter, while Nathan Bloch, W6NJB, established a portable 2 meter/440 MHz station in the gym of the high school. Both stations were on the air in short time. Later in the evening, Dennis Reavis, KC9IRL, and Archie Hawley, N9ZMM, showed up to support and help as backups when needed. Throughout the night there were status checks from the EOC to "Shelter 1" to see if anyone had checked in. The shelter did not have any takers and was closed at 2300 and the ARES members were released at both sites. A "stand down" call was sent out. On Wednesday, March 20th, 2013 at 9:03 AM, the Puerto Rico Emergency Management Agency (PREMA, Agencia Estatal para el Manejo de Emergencia y Administración de Desastres, AEMEAD) again participated in the now yearly exercise Caribe Wave/Lantex 13, in conjunction with the Puerto Rico Seismic Network (Red Sismica de Puerto Rico) and other agencies. The scenario was a tsunami situation, based on an earthquake that had its epicenter 57 miles north of the island of Aruba. The purpose of the exercise was mainly to test the communications of the emergency agencies throughout the Caribbean, although many municipalities conducted their own evacuation drills to also test response to emergency alerts. With astonishing speed and efficiency, the Boston Marathon radio communications support converted to a major disaster operation, and the criminals were brought to swift justice. It's all due to the country's massive investment of resources into emergency management and interoperability initiatives post 9/11 and Katrina. The investment is paying rich dividends in public safety now and for the future. The Amateur Radio community is part and parcel of this investment. I was sitting in the waiting room of a local (Daytona Beach, Florida) two-way radio shop recently waiting for a technician to drill a hole in the roof of my pick-up truck for a 2-meter mount and antenna, and browsed the glossy PR pamphlet for the Volusia County EOC and Sheriff's dispatch center. Smack in the middle of the short list of features on page one was this one that jumped off the page at me: "Ham Radio Center." I smiled and asked the clerk if I could keep the brochure -- "sure." It's now on my desk as a reminder of the integral part we play nowadays in the vast arena of public safety.